Adorable 8.5 X 11" Birth Certificate. Adorable 5 X 7" Birth Certificate with a picture of Baby Dolphins. Certificate has Baby Animals with a Dot Border. 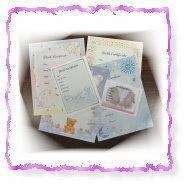 Adorable Birth Certificate 5" by 7"